Annette King is New Zealand's longest-serving women MP - 1984-2017 less three years in the wilderness from 1990-1993. In her 30 years in Parliament, she spent 15 in government (10 as a cabinet minister) and 15 in opposition. She is a former deputy leader of the Labour Party, and ... read full description below. Annette King is New Zealand's longest-serving women MP - 1984-2017 less three years in the wilderness from 1990-1993. In her 30 years in Parliament, she spent 15 in government (10 as a cabinet minister) and 15 in opposition. She is a former deputy leader of the Labour Party, and held a number of senior cabinet portfolios. This book will take a dual approach to her life and political career. Annette's career embraces a tumultuous time in New Zealand politics and Labour politics . . . Rogernomics and Lange's independent foreign policy; the 1990s and advent of MMP; the refinement of Rogernomics under Ruth Richardson etc; the rise and nearly fall of Helen Clark; the Clark government (where Annette served as Health, Food Safety, Police, Transport, Justice and Racing Minister); the subsequent 9 years of difficult and troubled opposition for Labour; and eventually the rise of Jacinda Ardern. Annette played pivotal roles in all these eras, often as the peacemaker or as Auntie Annette. She became a mentor for many of the prominent members of the Ardern government and, of course, played a lead role in the 2017 election campaign and subsequent negotiations. 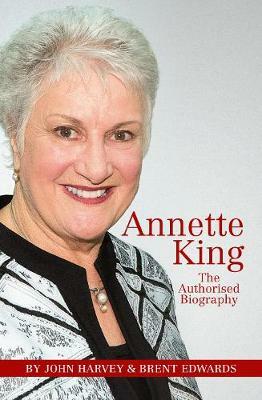 The book will give rein to Annette's voice, but also feature other prominent figures including Jacinda. The book will open with the 2017 campaign. After three years as a student journalist and editor at Auckland University, JOHN HARVEY joined the Auckland Star as a reporter in 1966. He subsequently worked in Brisbane and as a features writer and London sports editor for Westminster Press in Fleet Street. In 1973 he joined the Manawatu Standard, and was an award-winning editor of that newspaper between 1985 and 1999. He worked in Parliament as a press secretary from late 1999 to 2012. He has written books on All Black Bull Allen and on Manawatu, and contributed to a number of journalism texts. He is married to Judy McGregor, and has one son by a former marriage. BRENT EDWARDS has been a journalist for 36 years and has covered politics since 1989 when he started work in the parliamentary press gallery for the Evening Post. He became political editor before joining Radio New Zealand as economics correspondent in 2001. He went back to the press gallery in 2006 as RNZ's political editor, before becoming director of news in 2015, a job he left two years later. Brent lives in Porirua with his wife Katherine. They have three adult sons.